Can't get enough of pumpkin-flavored everything? Neither can we, so we've rounded up where you can find the best pumpkin treats in Saratoga Springs, from pumpkin coffee to pumpkin ice cream and beyond. Read on to find out where all the pumpkin food and beverages are! Please note: Pumpkin treats are seasonal, and when they're available will vary from location to location. It's always safe to check with individual establishments first before heading out for all that pumpkin-y goodness. Kru Coffee, located on Marion Avenue in Saratoga Springs, offers a seasonal pumpkin latte as well as pumpkin scones. In addition, for 2018, they are launching a pumpkin flavor of their cold brew latte in partnership with Battenkill Creamery. Death Wish Coffee produces a Cauldron Aged Pumpkin. Cardamom, cinnamon, and ginger are simmered for about 12 hours and then mixed with unroasted coffee beans left to age 10 to 12 days (although maybe not in an actual cauldron). Although they are based in Round Lake, you can find Death Wish Coffee products at the Saratoga Price Chopper and at other locations; you can put your zip code into their website to find spots carrying their coffee. 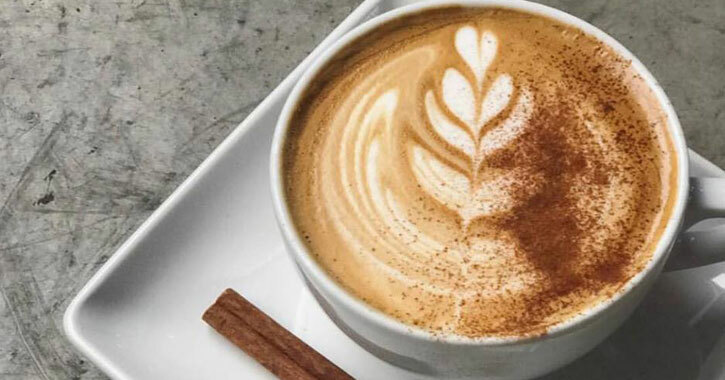 Mrs. London's is serving up delicious pumpkin spice lattes, so grab one next time you're out and about on Broadway! Saratoga Coffee Traders is one of the places that carries Death Wish Coffee, and they also offer pumpkin muffins while supplies last; they typically restock their pumpkin items on Thursdays. You can also find them right on Broadway. Bailey's Cafe on Phila Street has an organic pumpkin spice latte, but that's not all! They also offer a Pumpkin Toddy - pumpkin-infused brandy, local honey, hot water, a dash of cinnamon, and an orange slice garnish. Saratoga Winery has more than just wine! This fall they're serving up Southern Tier Pumking, a pumpkin flavored beer, in addition to apple cider mimosas and salted caramel apple cocktails. To get to Saratoga Winery just head west on Route 29. Sam Adams always has some great seasonal beer, and you can enjoy their Octoberfest beer at The Parting Glass on Lake Avenue. Sweet Mimi's on Phila Street is offering both a pumpkin coffee and a number of pumpkin food items that look seriously delicious. The coffee is called Autumn Adfaggato, and it's a dark roast coffee with a scoop of cinnamon gelato and a bit of pumpkin spice. That will be offered September 21, 2018 through Thanksgiving. They also have pumpkin streusel muffins, pumpkin bars, and starting November 1st and going through Black Friday, Pumpkin Bread Baked French Toast. 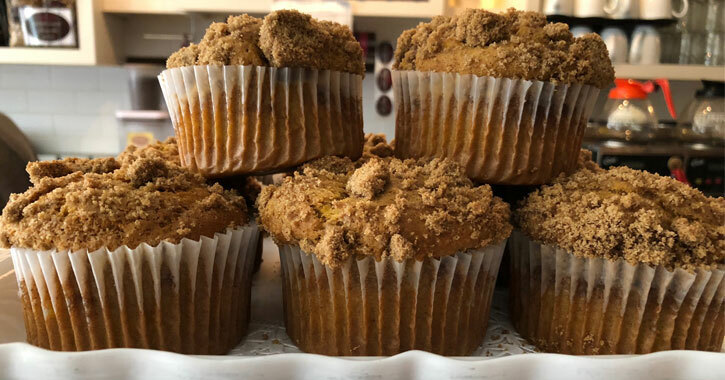 Bread Basket Bakery has pumpkin apple streusel muffins (which are offered all year, not just in the fall), and as of mid-September 2018 they are expecting to have pumpkin scones soon. Throughout October and November they'll be offering pumpkin cupcakes and cakes, that have a sweet cinnamon cream cheese buttercream on them - yum! Find them on Spring Street. Adirondack Creamery puts out a Pumpkin Pie Ice Cream each fall with a special blend of spices and pure pumpkin. They suggest pairing the pumpkin pie ice cream with vanilla ice cream and skip baking an actual pie. You can find their seasonal ice cream at Healthy Living (in Wilton Mall) and Four Seasons (on Phila Street and Henry Street), as well as at HillCrest Foods (on Edie Road, off of Route 50). HillCrest Foods typically sells to wholesale customers, but they will sell retail. Saratoga Peanut Butter Company offers a seasonal Pumpkin Pandemonium. This is a pumpkin spice butter that you can order directly off their website, or, you may also be able to find it at Four Seasons, the Putnam Market on Broadway, or at the Saratoga Farmers Market. This one is more of a savory meal than a sweet treat: the Olde Bryan Inn on Maple Avenue currently has a Chicken & Pumpkin Walnut Sauté listed on their menu. Chicken breast strips are sautéed in a garlic butter and combined with fresh basil, broccoli, mushrooms, artichoke hearts, sundried tomatoes, and a sherry cream sauce - and it's all served over mouthwatering pumpkin walnut ravioli.